Apple includes a VNC server in every edition of Mac OS X 10.4 and later. You can start the server through a discrete check box in the Sharing preferences. This article refers to Mac OS X 10.4, aka Tiger. More recent versions are available on our VNC on Mac OS X page. A VNC server lets you control your Mac from another computer. The other computer does not need to be a Mac; it can be a Windows PC. There are a number of VNC servers available for the Mac. These are no longer needed with Mac OS X 10.4 and later. The VNC server built into your Mac is free, easy to switch on, and supported by Apple. 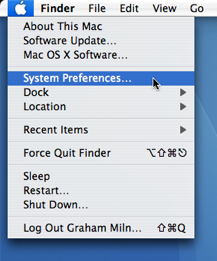 Screenshot 2: Open the Shared preferences. 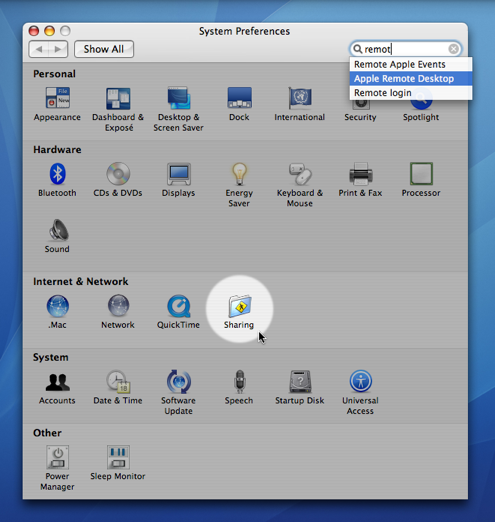 Enable Apple Remote Desktop within the Services panel. Screenshot 3: Enabled Apple Remote Desktop. Enable VNC viewers may control screen with password: in the Access Privileges… sheet. Screenshot 4: Enabled VNC viewers. Enter a hard to guess pass phrase. You will need this to connect from the remote computer. You are now running a VNC server and can connect remotely to your Mac. To connect you need a VNC viewer. Thankfully these are numerous and many are free. Try the oddly named Chicken of VNC — Wikipedia claims the name is a play on words referencing the Chicken of the Sea Tuna brand. The built-in VNC server on Mac OS X appears to be a little known feature. For administrators, and those looking after Macs for distant family members, VNC is fantastic. If you are looking for an easier, or one off, means of remote access, take a look at Fog Creek's Copilot service. This article was posted in Guide and tagged mac, remote, server, and VNC.